At BDE Manufacturing Technologies, Inc., we provide all these solutions and more, with our computer aided manufacturing services. 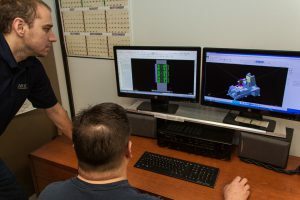 Our computers aided design machines can accept files or drawings in different formats, such as GIF, JPG, BMP, PDF, TIFF, DXF, and DWG. Our machines are capable of creating components from different types of steel alloys. We can also take on projects with special materials. Our services are designed adhering to regulations laid down in ISO 9001:2008. CAM can provide customers a variety of benefits that they will not receive from other machining services. • CAM systems allow us to use the full extent of our production equipment. These include multiaxis milling and turning machines, and Electric Discharge Machining (EDM) systems. • The use of CAM allows us to create a defined component manufacturing plan. Due to this, we are able to manufacture parts with dimensions, and specifications. • CAM systems can be integrated with Product Lifecycle Management (PLM) programs. This helps us use the right data and resources to create any product while saving on time and costs. • The systems can help in verifying and optimizing numerical control (NC) programs to enhance overall machining productivity. Please peruse through our other Capabilities pages, and the inner pages for more details. If you would like to know more about our computer aided manufacturing services, please feel free to contact us via email on info@bdeinc.com. You can also call us on 866-262-6233.